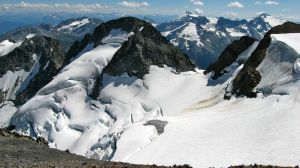 A rugged peak on the east side of the Overlord Mountain massif in the Fitzsimmons Range in Garibaldi Provincial Park. It's surrounded by glacial ice and provides an interesting gatekeeper for those on the traditional Spearhead ski traverse. It is easily ascended from the col between Mount Fitzsimmons and Benvolio Peak. Name Notes: Likely named after Bob Fitzsimmons, who cut a trail up the Fitzsimmons Creek valley to access mining claims in the vicinity of Fissile Peak in 1912.